In Virginia Beach, VA, our caring dentists understand how to create comfortable treatments for uncomfortable dental conditions. Tooth pain usually indicates a major problem for your oral health. In fact, you may need root canal therapy! If you or a family member is experiencing pain, aching, or throbbing in one or more teeth, please call Smile by Design now to make an appointment. A toothache generally indicates a root canal infection. Root canal infections occur most often in teeth compromised by decay or cracks, or teeth that are broken. Oral bacteria infiltrate the tooth’s interior and infect the nerve and pulp. Once these tissues become diseased, the only way to save to your tooth is to perform root canal therapy. If the tooth is very infected or just too far gone, it may be necessary to extract the tooth. However, our Virginia Beach dentists always try to perform the most conservative treatments that will save as much tooth structure as possible. Experiencing tooth pain of any kind is never good, and the longer you wait to see the dentist, the worse the damage to your tooth and gums. With root canal therapy, our dentists will remove the diseased tissues, gently clean the interior of your tooth, and then fill it with a dental material called gutta percha. 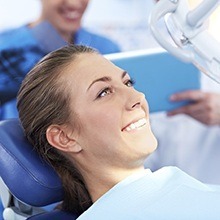 Root canal therapy alleviates toothache pain and returns your oral health. If you’re fearful that root canal therapy may be painful, please know that our team at Smile by Design focuses completely on your optimal comfort throughout the course of your treatment. At our Virginia Beach office, we are very gentle and we want to alleviate your dental pain as quickly as possible. After your root canal therapy is completed, we recommend the addition of a porcelain crown. 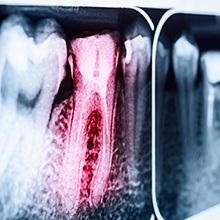 Getting a tooth restoration is an important follow-up to root canal therapy. Once the diseased tissues have been removed and the tooth cleansed, it becomes hollow, and therefore weakened. Adding a porcelain crown strengthens your tooth, and ensures your smile remains beautiful for years to come.